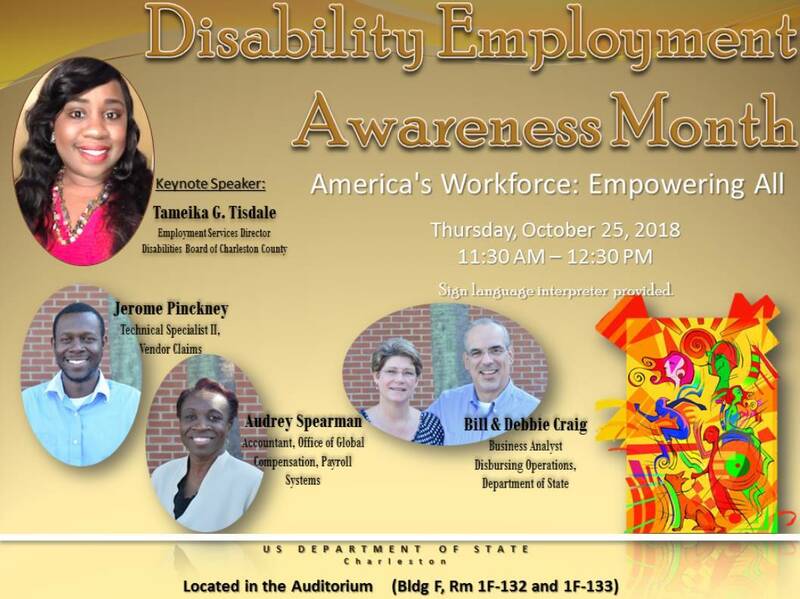 On October 25, 2018 in honor of National Disability Employment Awareness Month (NDEAM) the US Department of State – Charleston held an event titled “America’s Workforce, Empowering All”. The event celebrated NDEAM and the important role people with disabilities play in our communities. The Keynote Speaker for this event was our own Tameika G. Tisdale, Employment Services Director. At the Disabilities Board Tameika leads a team of Employment Specialists in supporting the employment goals of individuals with developmental disabilities. Tameika is a native of Charleston and holds a Masters in Human Services.